Want to help find the next gravitational wave? You don't need to be a physicist to help build on the latest discovery. February 16, 2016, 12:40 p.m.
Albert Einstein won the 1921 Nobel Prize for his astounding work in the field of theoretical physics. His theory of general relativity, published in 1915, made some mind-bending predictions that were difficult to confirm, including the existence of gravitational waves, minute ripples in the fabric of space-time caused by cataclysmic events of astronomical proportions. More prizes likely await the modern scientists who were finally able to detect this special phenomenon, for which a little background is in order. Gravitational waves caused by the collision and merging of two black holes located 1.3 billion light-years from Earth were detected on Sept. 14, 2015, by the twin Laser Interferometer Gravitational-wave Observatory (LIGO) detectors in Livingston, Louisiana, and Hanford, Washington. LIGO scientists estimate that the black holes were about 29 and 36 times the mass of the sun, and the collision converted three times the mass of the sun into gravitational waves in less than a second with a peak power output about 50 times that of the whole visible universe. What’s exciting about gravitational waves is the new way they will allow us to study the universe — and that's where you come in. It's possible that gravitational waves will allow us to discover all kinds of things that are impossible to detect with traditional instruments that look for radio waves, visible light, infrared light, X-rays or gamma rays. These methods have their advantages, but they share a limitation: they can be blocked or distorted as they make their way to us. Gravitational waves are hard to detect, but they have the benefit of passing unimpeded through everything, allowing us to detect objects that produce no light or radiation, like black holes. 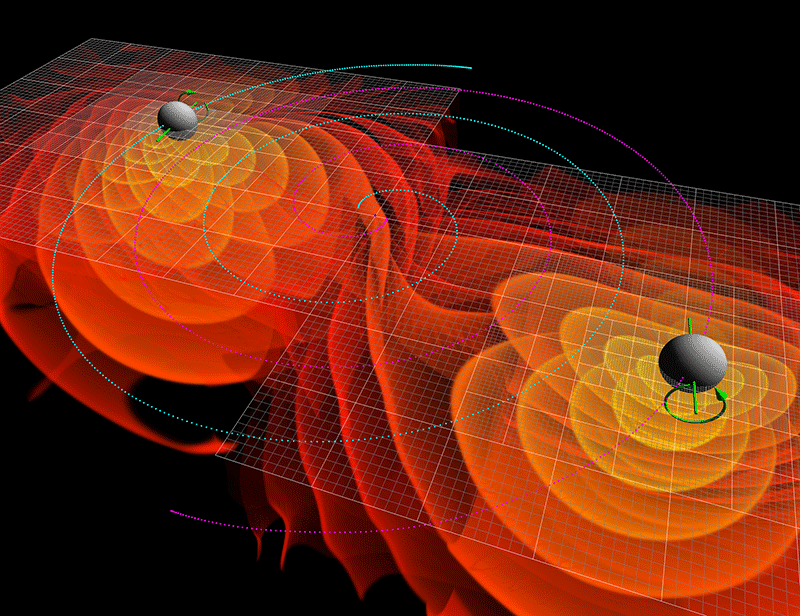 So how can you help physicists find the next gravitational wave? If the recent discovery of gravitational waves has you excited, you’re not alone. But if you don’t have a Ph.D. in physics, you probably don’t feel you'll be of much help. But that's not quite the case. Anyone with a computer can take part in the search for gravitational waves thanks to a distributed computing project supported by the American Physical Society (APS) and the National Science Foundation (NSF), and run by the University of Wisconsin–Milwaukee and the Max Planck Institute for Gravitational Physics at the Albert Einstein Institute in Hannover, Germany. The project, aptly named Einstein@home, makes use of the computers of volunteers from all around the world to crunch data produced by the LIGO detectors (the same ones that made the recent discovery) to look for evidence of continuous gravitational-wave sources. These are different from the quarter-of-a-second gravitational wave detected in September 2015 because they are thought to originate from continuous sources like spinning neutron stars (also known as pulsars) rather than one-time events like the collision of two black holes. The idea is simple: The LIGO detectors produce too much data for any one university or research project to sift through. So this mountain of data is split into more manageable slices that are then uploaded to the computers of volunteers via the internet. All volunteers have to do is install some software that runs whenever the computer isn’t being used (you can also use it as a screensaver, as in the image above). When a computer is done searching through a slice of data for evidence of gravitational waves, it uploads whatever it has found back to the Einstein@home projects where the results are analyzed further. So far the distributed computing project hasn’t found a gravitational wave, but a sister project run on the same volunteer infrastructure has helped it discover 51 radio pulsars. These known spinning neutron stars help increase the odds of finding something more important by better targeting searches. It's an exciting time for the project. The first-generation LIGO detectors were shut down five years ago and upgraded for more sensitivity. The new operations began last fall. The new detectors can already "see" three to six times farther than the original, and over the next two years, this sensitivity is expected to increase by a factor of 10, vastly increasing the number of potentially detectable sources of continuous gravitational waves. What if your computer was the one to find the first continuous gravitational wave? To volunteer, simply follow the instructions on the left side of the Einstein@home website. Even if you're not a physicist, you can help build on the latest discovery, thanks to the Einstein@home project.